What's on Sydney is Sydneysiders number one guide to What's on, here you can read our news and reviews. 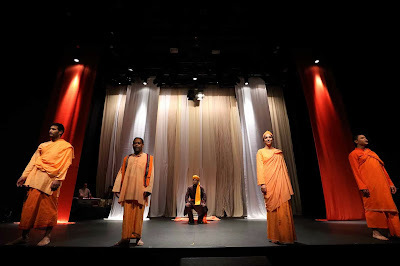 In celebrating the 150th birth anniversary of Swami Vivekananda, the Sydney Opera Playhouse hosts “Oneness”, a play on the extraordinary life of Swami Vivikananda. With the combined efforts of Alex Broun, a well-known Australian director and scriptwriter, musical director; Dr Kim Cunio, Tobiyah Feller; production designer and Robert Grant; research consultant, Madhuparna Sen was able to realise her vision, a vision that was to be a hallmark in the Vendata Movement in Australia. Staging a play about a spiritual leader takes a lot of collaboration, patience and faith. This play was no exception. The play follows the Swami on his journey to spiritual enlightenment- from boyhood up until his death at thirty-nine. The play replicates locations and time-periods with great versatility- using symbolism in cloth and quick costume changes. The play was long, but the dialogue was heavy with content and the production did very well to manage such a grand narrative onto one stage, with minimal mis en scene. Using Hinduism as a springboard to a spirituality that is non-dualistic, the Swami promoted faith in the self and love for God, whoever your God is, whatever religion/spirituality you partake in. In this respect, the play was very informative for newcomers to the spirituality (I had no prior knowledge on the movement) and was more of a celebration than anything else. The whole event was well conducted. Nuns and monks, prominent figures from the movement in Australia, among others, were invited to the audience. Souvenir programmes were informative not only about the play, but its inception as well as a quick-history on the movement and figure-head to contextualise the audience. The production was very effective and very resourceful in its use of cast, with little actors playing many roles which were distinct and easy to follow. This stands as a testament to the production designer, costuming and the calibre of the acting. The use of symbolism, for example a chaotic bustle of people with yellow lighting to represent the spiritual turmoil of the Swami, was rather effective. Younger Swami Vivikanandra, played by Bali Padda, was passionate and very believable in his role, a pleasure to watch. Special commendations go to Shaheb Chatterjee for his very heartfelt representation of the older Swami Vivikanandra. His singing was pure, his on-stage presence was passionate, peaceful and altogether powerful. Performing to the side of the play was the ensemble, who held the music score and dictated the ambience of the scenes. Congratulations to Heather Lee for her solo performances. At times, the music overpowered the dialogue a little, but was great at creating atmosphere nonetheless. This production was very well-executed and received their well-deserved standing-ovation. Swag Bucks is a very popular work from home site.